This Tri-Colored Twig shawl kit is created from yummy merino! 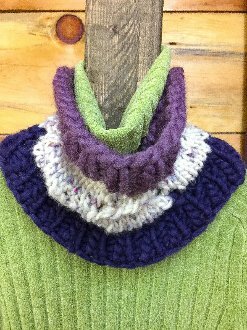 In the "skill builder" kit, you'll learn about ribbing, changing colors and a little bit of lace, and when you're done, you'll have a lucious accessory to keep you warm! All hanks will be rolled into cakes for you before shipping.